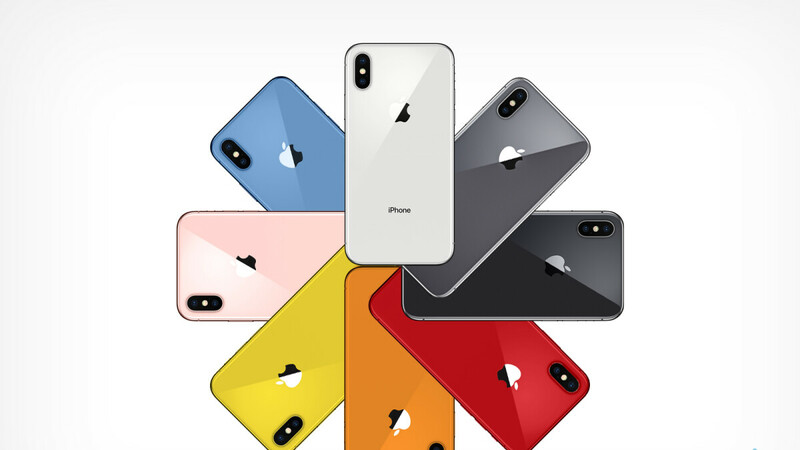 Apple is expected to launch a total of three iPhone models this year, and according to reliable market analyst Ming-Chi Kuo, they will come in a variety of never-before-seen on an iPhone colors (not counting the plasticky 5c), including yellow, orange, and blue. It's not clear yet which models will be available in what colors, but according to Kuo, the rumored, 6.5-inch OLED iPhone may be available in black, white, and a new gold color, while 6.1-inch LED may come in grey, white, blue, red, and orange variants. 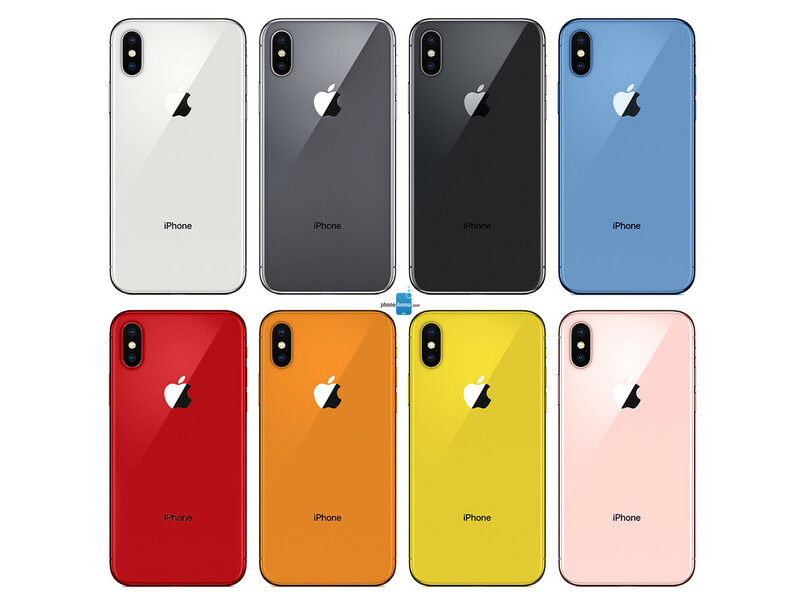 Moreover, according to reliable tipster @OnLeaks, Apple engineers are experimenting with "White, Black (likely Space Gray), Grey (lighter grey), Red, Blue, Yellow, Orange and Pink," although some of these color options may be dropped after the prototyping stage is over. But even if one or two don't make it into the final roster, what's left is still more than we've ever seen in Apple's smartphone lineup, excluding the iPhone 5c, which came in five pastel shades (green, blue, yellow, pink and white). Heck, if the 2018 iPhone is made available in as many shades as rumors are suggesting, it will be able to rival the Game Boy in terms of color options. Well, there won't be a crystal clear one, but we digress. Another interesting tidbit is that Apple is reportedly planning to launch a red iPhone this year, which (as far as we know) won't be a part of the company's Product (RED) lineup. As such, we can't say for sure whether it'll get the saturated, punchy shade of red that the Product lineup is know for, but it could be very similar. After all, fans have been clamoring for a red iPhone with a black front for quite a while, and this could be it. So, what do you think about the rainbow of iPhone color options that Apple is rumored to launch this year? Which one do you like the best, and, on a side note, are you bored of white, black, and grey phones? We feel like these three colors have been associated with premium devices and have dominated smartphone designs long enough. So, we are glad to hear that this year's iPhones may be available in so many different shades. What do you think? Tell us in the comments below! The colors mean Jack, especially if iPhones have a glass back. You will need a case anyway. So who gives a crap about the color of the iPhone these days. People are forgetting that Apple charges over $500 to repair the glass back on the iPhone X, and over $400 to repair the glass back on a iPhone 8 plus. Talk about a joke. Oh, wow a clear case, amazing! Not! Your missing the point, you are still buying and using a case, period. You may as well buy a color case instead of a clear case, especially when they will cost roughly the same. Therefore making the actual color of the iPhone a moot point. You need to find a new hobby because what you do in a daily basis is not healthy. To him it's not about choice. He likes to trash Apple in a daily basis and shoe horn Apple in every article whenever he gets the chance. Somebody at Apple really hurt that dude. Clear cases gets a yellow tint to them over time, and that's just a result of the material used. You can't do much about it. So i've had clear cases and i'm not a fan. I would rather have a solid color case then than a clear case. They're just not worth it. You also take away quite a bit of the beauty of the phone, especially the ergonomics, when you slap a clear case on it. Never used a case for any of my phones, not for the iPhone X either. Why would anyone need a case? There are lot of people that are not dropping their phones (I dropped my last one 3y ago), other people have insurance; so we don't "need" a case. Seems you forget that the first glass phone is iPhone 4!. iPhone has more after market items than any phone around, so don’t worry about it. This reminds me of what they did with the 5S, 5C color options in 2013. But that had a hard plastic back. So no case was needed. These new iPhones all have glass backs. So the color doesn't mean a thing, especially when these new iPhones will have a case on them. If customers don't use a case on them. It's only a matter of time when the glass back gets a crack or breaks in general. "Quit your sick obsession with Apple" It's beyond ironic coming from you. You literally have an Apple eating an Android as your profile picture. If he's obsessed, then there isn't any words to describe your state of affliction with Apple. I’d buy that blue in a heart beat. I’d love to see a blush gold model, probably get Product Red midway thru the cycle. Nice color. But still prefer space grey espically with glass looks dope wondering if Apple going to release the old desgin iPhone again with upcoming iPhone 9 plus ? I want green color option like on 5c!!! The orange one is nice (IMO). Liking some of them color options, yeah the light blue and orange covers look good. Most are done or coming next month but I guess that's copying right? Do what? Release the smartphone in a multitude of colors? You do know that Samsung has been doing that for years, right? Look at the S8 or S9. It's Apple that doesn't launch their phones with a lot of color options, so if you want to call out someone for copying, then it's Apple. Ericsson used a beautiful dark green color for its T29 model that I would like to see in a phone today. Other than that, I'll stick to black. GIVE ME BLUE. DAMNIT. PLEASE.